I do these things more often than I would like to admit. : Last Saturday evening, the night before I was to dance at my own church for Pentecost, I seriously contemplated backing out. In this post, I share what kept me from doing that and what I learned about the choreography process that may help you as well. I also (spoiler alert) include a video of the dance I did end up sharing. Last Tuesday, my husband, who is also my pastor at Missio Community church, emailed me to ask if I had a dance I could share at Pentecost. I consider it a huge privilege to dance in the worship service, have choreographed dances a couple of songs that are appropriate for Pentecost Sunday, and sensed a “yes” in my spirit, (see my blog post entitled, “Doors Open When We Say Yes“) and so I told him that I could and would love to dance. Last week was super busy with preparations for the end of the year for the classes I teach. 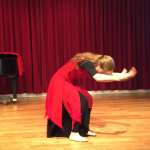 I spent Saturday morning in the studio prayerfully working on choreography. I made decent progress. The rest of the day, I spent at my son’s track meet and preparing meals for my family. On Saturday evening, I closed myself in my room to finish choreographing. I had parts of the dance, ideas for each part, but I didn’t have the dance, and I didn’t even love what I had. And I didn’t even have the lyrics memorized. 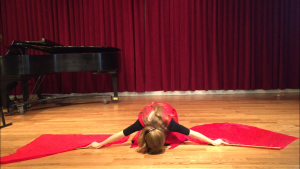 One thing I had on my side was that the song I was choreographing to was a prayer for the infilling of the Spirit. I kept going back to the words and praying them. I kept praying but felt discouraged and even fearful. It was at this point that I considered backing out. They would understand, since I had only been asked to dance on Tuesday, right? It would be better not to dance than to get up before the congregation and share a dance that was not really finished and not anointed, right? With all these performing artists around, who are you to take the stage and think you can dance? If you get up there and flap your arms around, you are just going to look foolish. But there were a couple of things that kept me from crying “Uncle” at this point. Firstly, a friend who had been planning to miss church had told me she would attend church after all since I was dancing. Secondly, I kept thinking of my mentors, Jocelyn Richard and Pastor Lynn Hayden, and I knew they would tell me that I could do this. Thirdly, I had a sense that the Spirit might want to use dance to get beyond the intellect of these smart believers and touch their heart in a new way. At that moment, my fear and discouragement lifted. I spent time praying for him and then, in my mind, walked through my lyrics. I saw the dance. I did this several times and then went to sleep, setting an early alarm for the morning. In the morning, I went alone to our worship space and worked out in my body I had seen in my mind the night before. I was filled with joy and hope about it. 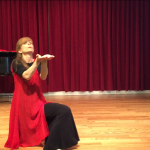 I was able to dance with joy and share my gift with our congregation. I and others sensed the presence of the Holy Spirit, and I got one of my favorite kinds of comments afterward. 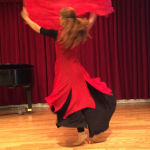 A gentleman told me, “I’ve never liked liturgical dance before, but when you danced, I got the connection between the words and the movements, and it spoke to me.” One thing I believe I’ve been called to is to dance in a way that disarms those who are wary of liturgical dance. So, I was encouraged. So, in a nutshell, what did I learn and how can it help you? Choreography is a process. It may look messy in the middle, but as you continue to prayerfully work it out, what feels feeble and disjointed can become cohesive and powerful in the end. Find ways to get your focus off of yourself. Pray for those before whom you will be dancing. Pray for others whom you know are ministering – your pastor, the worship leaders, the Sunday School teachers at your church. Anything you can do to get your eyes off of yourself and your weaknesses will free you to receive what the Lord has to give you. Have you ever contemplated backing out of a ministry assignment? What did you decide and why? What helps you when you get stuck with choreography? So….I had not seen your blog and guess what? I just about backed out of dancing at our camp service this next Saturday, June 2nd!! What happened is that the song, Spirit Move, had been on the line-up for the Praise Team singers to learn since February and I was able to complete a few weeks later in anticipation and excitement to use Bobbi’s silk flags again. Well, I waited and waited and waited. There was always something blocking the singers and the dancers to perform it. Then, finally the singers sang the song….when I was out of town and couldn’t go to the practice!!! Then after talking to one of the singers, which is my niece who sings the solo part, said that they will probably be singing the song at camp. So I started thinking about it, asked the other dancer if she would be there-yes, she would, and thought I should run it by the assist. pastor and the music minister since we had never ever danced at camp even though we have had a dance team for over 10 years. Then I started to freak a little….I’m too old, camp is for the youth….I’m not good enough…others won’t like it….how come nobody has answered my texts…. I then texted both the assist pastor and music minister that I had changed my mind and decided not to go through with it when the music minister replied on text, “I think it is a good idea to dance at camp.” Just those simple words changed the whole situation. Even though we want God to speak to us, sometimes He uses others to encourage and support us to move forward. So help me pray that we touch hearts through our dance and God’s leading this next Saturday…while your conference is going on!! Blessings to all!! Thanks so much for sharing this, Christine! It is very vulnerable to dance. We stand before the congregation offering all of ourselves. God knows when we need a bit of encouragement and provided it at just the right minute for you because He wants to you dance at this camp. It was His idea in the first place. I do pray with you that you touch hearts and minister as you follow His leading. Your title caught me off guard, but thanks for sharing! Just last night, my youth dance ministry “DID” back out of an assignment, for a whole host of reasons (including that one half of the sponsoring leadership did not know we had been invited and it was causing a bit of conflict), but it was a very last-minute assignment that I should probably not have accepted. The one thing that that experience exposed to me, though, was how absolutely “apprehensive” and “fearful” the young girls/teens were to dance in front of their middle-school peers. (They shared that they felt more comfortable dancing in a church environment, where people were more ‘accepting’ of them.) !!! I can see I have more work to do, as I explain to them where another ‘real’ ministry field is. This left me wondering lots of things, including what kind of student they were in school ~ where they felt their peers/older youth might ridicule them for their ‘church work,’ or their ‘work for The Lord’ ~ and what their faith walk is like. Tre intersante!! Thanks so much for sharing. 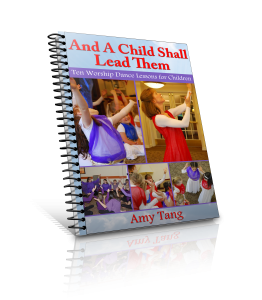 It’s so good that you are reflecting on this and seeing it as a discipling opportunity for your dancers. There is so much vulnerability in dancing – we present our bodies, our skill, our creativity not just to the Lord, but in a real way before people. If we are not secure in Christ, his love for us, and His calling, the enemy has so much room to torment and intimidate us. I hope your girls will have another opportunity like this to dance outside the church, even in front of their peers, so you can shepherd them through their fears and so the Lord can show them how powerful and needed their dance is to those they fear. Have you heard the song, Fear is a Liar, by Zach Williams? You might listen to it and share it with them. Easter Experience has always been a special day for me and the Dance Ministry I belong. On that special day which falls in April, we decided to blend Mime with Spoken word,on that note we started work out but getting to two days before the main event,plans changed by excuses from some ministers which will definitely distort our preparation. To cut the long story short, I took it upon myself to go all in as Solo with one of our minister who is good spoken word to support it. The surprising side of it is that I had never mime fully before and we were counting on friend who is good in that area to minister but He never made it, so on that same day I had to prepare early in the morning to rehearse and minister in the same day evening. It went on successfully so as the main ministration. I was touch, it was powerful, this is my first time felt a release in my spirit. Finally my Local branch Pastor Ewesie Mensah of the ICGC- International central Gospel church (Upper Room Temple) Head Pastor Mensa Otabil Accra Ghana. Said He still have that ministration ringing in His mind. Wow I bless for what he is using us to do in these end time. Thank you for sharing your story. It sounds like the Lord led you and empowered your mime presentation, enabling you to go beyond what your own capabilities. Praise God.